I am reminded of this scene during the two Nordicana Borgen sessions (and Sofia Helin’s Q&A after the screening of The Bridge series 2 finale) last weekend. The audience of every nation has its own perspectives. Alastair Mackenzie is a case in point. For many British viewers, Birgitte’s series 3 squeeze just didn’t cut it, especially in comparison to Mikael Birkkjær. But as Adam Price points out, getting Birgitte back with Philip would have been dramatically unsatisfying. The idea was that Birgitte’s international status required her to date a non-Dane. Thus was born the idea of Jeremy, a British Architect. (I like to think that Jeremy would drive an old Rover 800.) But for Sidse, this meant doing a casting with 8 different actors – like internet dating. ‘I felt like an old whore, flirting away with man after man, trying to fall in love,’ she says. And she sticks up for her screen lover: he’s dark, handsome and what women want. While British women swoon over the foreign-and-therefore-exotic Birkkjær, Danish women do the same for their foreign-and-therefore-exotic Mackenzie. We’ll come back to the flirting. But as the actors and producers of Nordic Noir travel the world to promote their work, they receive different comments depending on where they are speaking. So in Scotland there’s been reflection on whether a newly-independent Edinburgh administration would make better cause with Copenhagen, Stockholm and Oslo than with London. England still finds coalition government a novelty. France can’t believe that Birgitte’s fashion choices weren’t endlessly analysed. There’s an underlying smugness throughout Europe (among the Scandi-fans, there’s no Euroscepticism) about the sophistication of subtitles and an undercurrent of superiority over the Americans who have to remake things rather than read words on the bottom of the screen: ‘Los Angeles is the hot air city,’ says Adam Price when asked about HBO’s wish to do another version. But – and perhaps understandably – the actors sense a little bit of neediness on the part of the audience. (Some of the audience have also become a little agitated because of technical problems.) So, as experts in working a crowd, they lay it on thick, as Torben would say. Pilou Asbæk reckons the Brits have great taste. Yes, Sidse, Marie and Sofie would be delighted to follow Birgitte Hjort Sørensen onto the London stage; no, they haven’t got a part in mind. Remembering that poor Alastair Mackenzie has been forgotten in his home country, Sidse makes the point of praising men in kilts – and by saying that she studied Tony Blair’s performance as a politician when developing the part of Birgitte. Her analysis of his personality is sharper than I’ve read than most commentators’ (though given that Warwick Business School run courses for leaders in conjunction with the Royal Shakespeare Company that shouldn’t be too much of a surprise). She readily admits that she feels like an ambassador for Borgen, DR and Denmark in general. Later that day, Sofia Helin will look over to the Danish ambassador and occasionally ask whether a particular answer is accurate. It’s tongue in cheek, of course, but the ease with which it’s done sends its own signal. The Saturday panel is an embarrassment of riches. Host Ben Preston – well-prepared and asking what you might call ‘real fans’ questions’ – could have interviewed Halfdan E or Marie Askehave for an hour on their own. Marie has one of the best anecdotes: that she was able to ring her best female friend and inform her that she’d be paid to romance the friend’s husband. Similarly, Camilla Hammerich is someone I’d like to hear more from. She and Pilou give a double act in which they explained that Kasper Juul’s broken leg in series 2 was the result of a real sports injury which occurred when Asbæk broke the terms of his DR contract to kick a ball about with his maters. Camilla wrote the script for Birgitte in which the Statsminister expresses her annoyance. I can’t help but feel, later, that the ruined moment of lust with Katrine later in that episode, was further punishment. We hear how Sidse used extra cushions on her chair so that she’d tower over other characters and feel more like the big cheese. We also hear how the set of the Statsminister’s office helped her get into the role – especially as people opened doors for her – so once they had left Borgen for the dank, dark offices of the New Democrats, she found it harder. (‘I had to share with awful people.’) Similarly, Pilou Asbæk found Kasper’s suit something that helped him define the character of the spin doctor: when he unbuttons, explains Pilou, he is becoming unglued. Both actors had said goodbye to their Borgen characters at the end of series 2 which meant reacquaintance once the third series was confirmed. It’s been much reported that Kasper’s much-reduced appearances in series 3 were down to Pilou’s work on other projects. (Adam Price: Camilla rang on the Monday and said Pilou will be bald on Wednesday. And we had to write something that would make sense.) In fact, the actor claims, the third series was his favourite, because he saw what the audience saw and he understood it all rather better. I am not sure that I believe that answer: Asbæk is enjoying himself, joking with his fellow actors and with the audience. His fellow acting lead will, the following day, say that he really grew up during the three series, but still regards herself as his big sister. But back to flirting. 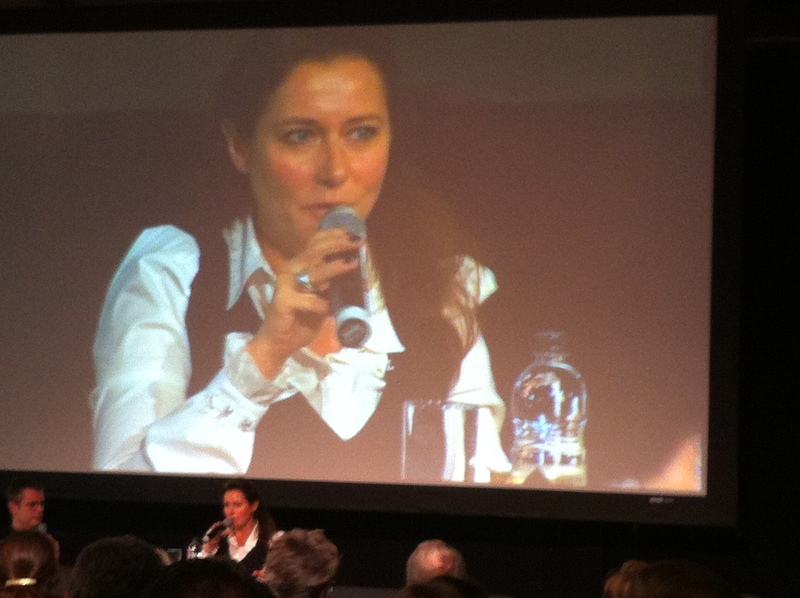 Sidse saw and loved The West Wing: the day she saw the last episode, she was invited to do the Borgen audition. She had to do a speech and a flirtatious scene (with the camera as the husband). She was appalled to pass the speech but fail the flirting. ‘I’ve been doing it for years!’ she roars. In a blog of this length it’s impossible to touch on more than a small number of the topics raised. There’s no space to discuss the way in which they introduced and dealt with Birgitte’s cancer, or Adam Price trying to excuse his intervention in Danish pig farming. But I’m left with a sense of the unreality of it all: these actors and producers in front of literally thousands of adoring fans, unable to explain the phenomenon of their success, tailoring their responses to the local priorities (Q: Danish TV has been good for Welsh TV, so my question is whether being trained as a clown help you play Birgitte?) and representing their nation. Last summer’s Nordicana was a far smaller affair and actors like Lars Knutzon and even Sidse herself could mingle with the crowds and chat. This time it’s out of the question: there are just too many people who want to say hello. Borgen may be over, but Britain’s love affair with the Danes is stronger than ever. Interested in your comments at the end about thousands of adoring fans. It’s the problem of crowds: how do you retain your critical faculties in a crowd? Where’s the dissent, or at least the skepticism? 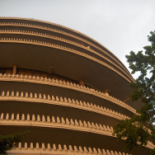 This entry was posted on 6 February 2014 by Cafe thinking in Borgen, MBA, Politics, TV, Uncategorized and tagged Adam Price, Borgen, Denmark, Nordicana, Sidse Babett Knudsen, Sofie Helin, The Bridge, Warwick Business School.